I've been playing with the DRA818V modules that have been making quite a stir in the amateur radio world at the moment. I haven't gotten one on a spectrum analyzer yet, but I have reason to believe that it will require a low pass filter to be RF legal. I'll write more about that once I get a look at it, but figured I'd first built myself a low pass filter in case I need it (if not for these modules, but some other VHF project in the future). 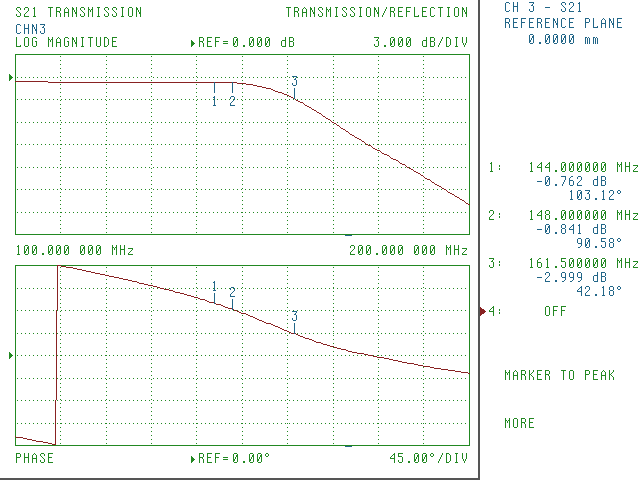 I decided to build a 5 pole T configuration Chebyshev filter with 0.1dB of ripple. 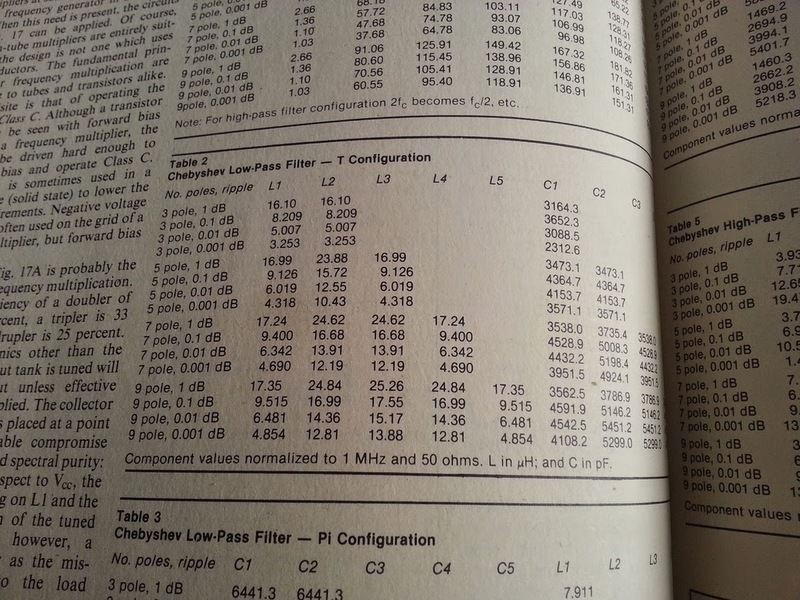 Looking this filter up in a random copy of the ARRL Handbook (1981, but any recent one will do), it gives the component values needed for a 50 ohm filter at 1MHz. 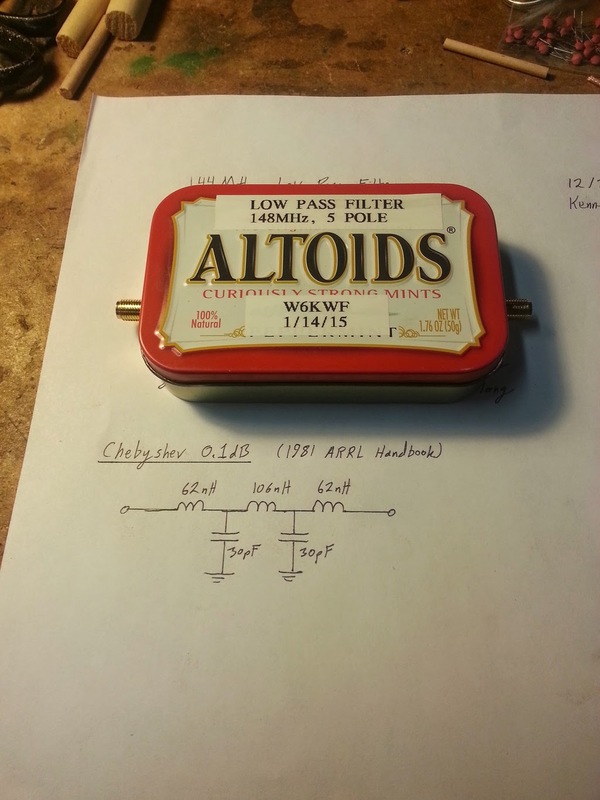 I'm also building this for 50 ohms, so all I need to convert is the frequency by dividing by 162MHz. To convert the inductance values into solenoid designs, I have an old magazine article from the 70s that published a whole table of different diameters of air wound inductors. 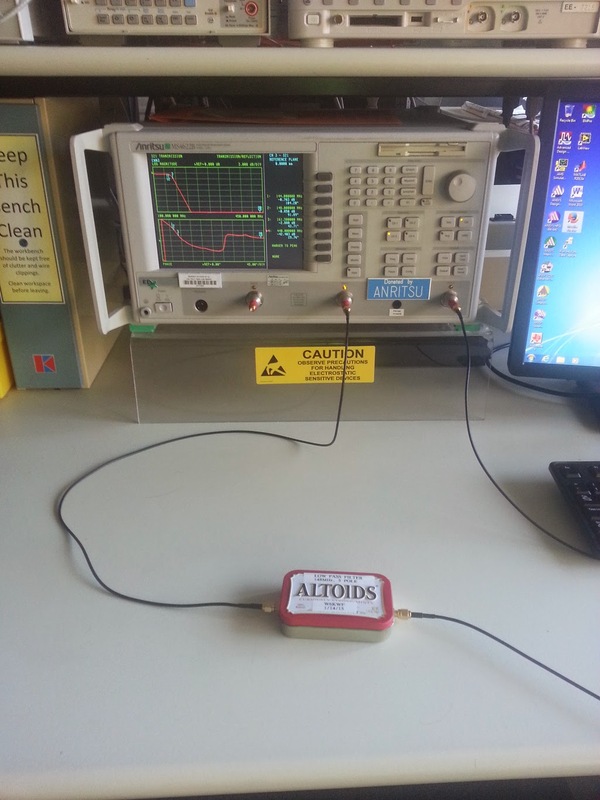 For extra blog cred, I built the filter in an Altoids tin with SMA connectors on each side. The four solder pads were formed from a strip of copper clad with three hacksaw cuts. Next step was hooking this up to a vector network analyzer to see how far off I ended up, which is when I realized that 150MHz was a poor corner frequency choice. 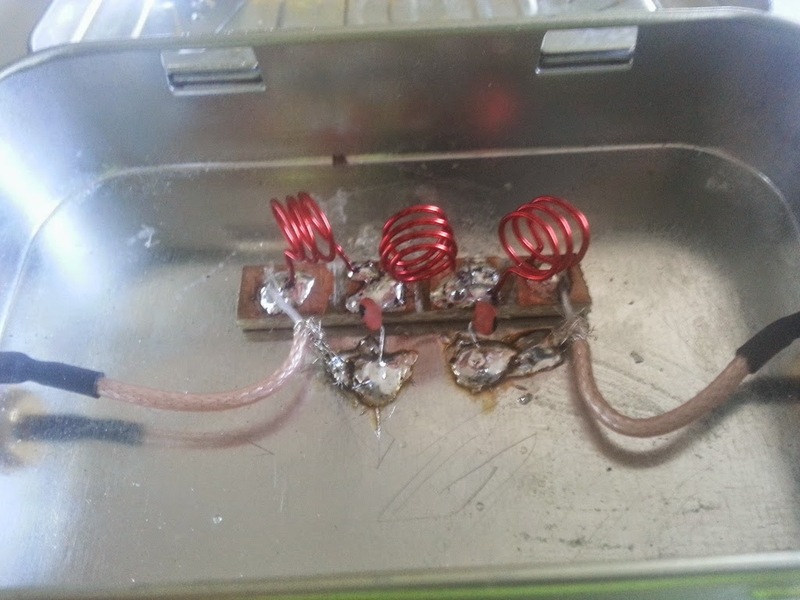 Reforming the inductors and taking a turn out of L2 got me closer, but I would have ended up with better performance if I had designed it all correctly from the start. The insertion loss at 2m isn't so great at 0.8dB. This would be improved by better component layout, but I built this filter kind of sloppy. 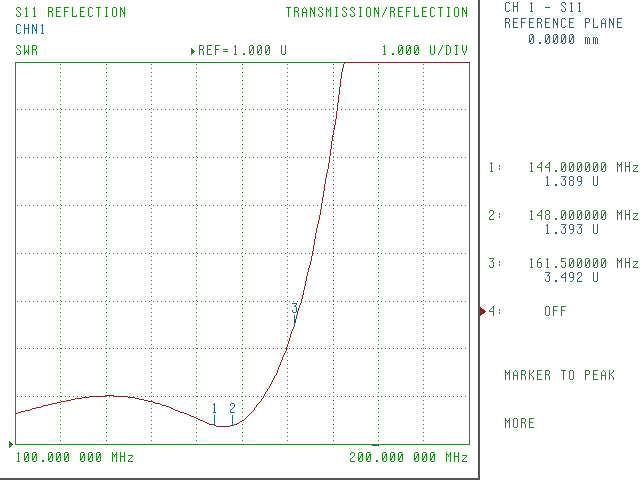 It does suppress all the harmonics of 2m as expected. I only bothered to note that 200MHz was down ~23dB, so 440MHz will be well below that. 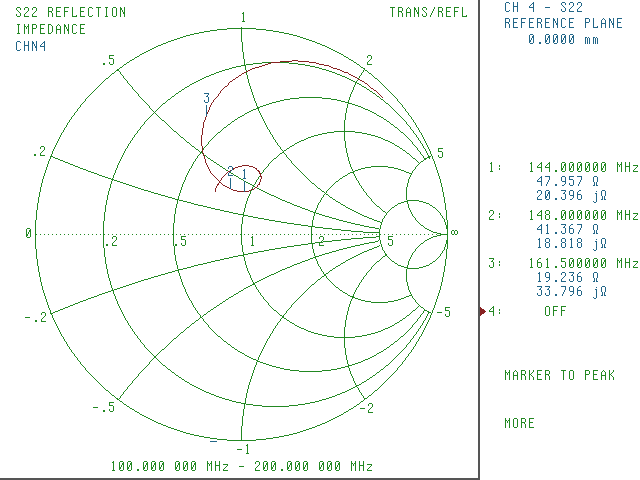 In an ideal world, points 1 and 2 on the smith chart would fall at the center (1,0), but 45+19j ohms is close enough for me. Now once I get to the point of experimenting with keying up my DRA818V modules, I'll have a nice LPF on hand in case the harmonics do end up too high for on the air testing.